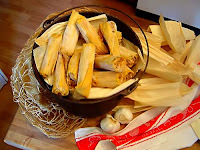 Soak and rinse the corn husks in lukewarm water. Set aside. Mix the masa with the butter and a little chicken broth until it is like a paste but not too wet. This will be the dough for the chuchitos. Season to taste. For the sauce, blend the tomato, miltomato, onion, garlic, chiles into a puree. Toast the pumpkin seeds, sesame seeds, cinnamon, and cloves in a pan under medium-low heat. Do not allow to burn. Add this mixture along with the soaked bread to the sauce. Blend and then pass through the colander. Season to taste. Sautee the sauce in a tbsp of hot butter, and add the chicken. Select the larger corn husks and dry them off. Tear off long strips from the smaller husks to use as the strings to tie the chuchitos. Take a large husk and place in the middle a tbsp of the masa. Spread it out over the husk like a tortilla. Place in the center of the masa a piece of the chicken with some sauce and fold up the husk to enclose. Tie with the strings you made from the husks. To cook, place the chuchuitos in a pan that has a steamer at the bottom so the water does not cover the chuchitos. Cover the chuchitos with a couple husks and the lid of the pan. Allow to steam cook for about 1 1/2 hours on lower heat. Each region makes our dishes a bit different but the sauce is closer to our tamales. They look good though. I'd like to start a blog so I can share my personal experience and thoughts online. Please let me know if you have any ideas or tips for brand new aspiring blog owners. Thankyou! also love the theme/design), I don't have time to read through it all at the moment but I have saved it and also added in your RSS feeds, so when I have time I will be back to read a lot more, Please do keep up the awesome job. Explorer but looks great in Firefox. Do you have any advice to help fix this issue? know I am getting knowledge all the time by reading thes nice content. Vitamins A, B-complex, C, and D are found in Sarsaparilla. Humans, naturally, do not like bitter flavors or foods. How to build muscle fast for men is through training in the gym or field. Hello there! I could have sworn I've been to this website before but after browsing through many of the posts I realized it's new to me. Regardless, I'm definitely pleased I came across it and I'll be bookmarking it and checking back frequently! am encountering troubles with your RSS. I don't understand why I am unable to subscribe to it. Is there anybody getting identical RSS problems? Anyone who knows the answer will you kindly respond? Thanx! !